Side note: For even more Twitter drama, check out Brand Party, a hilarious “social” experiment orchestrated by a friend of a friend who decided to wrangle his favorite brands into one weird-as-hell interaction. The point is, while CPK simultaneously embarrassed me in front of my friends followers, I decided to invite my home-state inspired chain restaurant back into my life. After all, it’s not called California Piccata Kitchen. 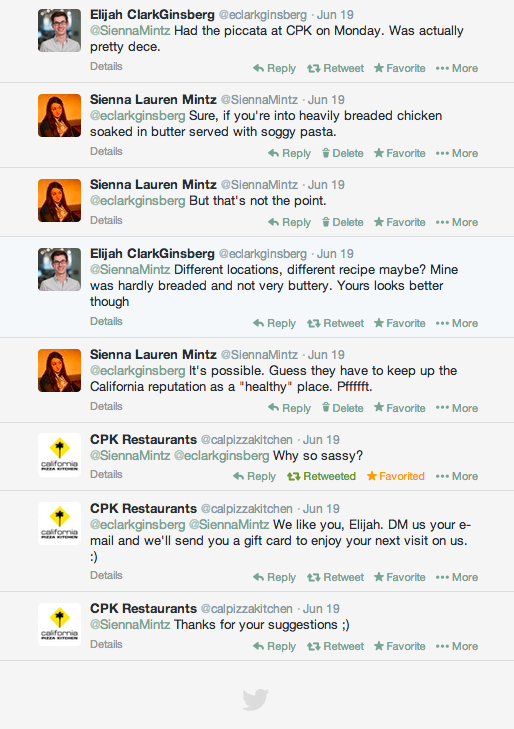 Plus, CPK is one of the only decent places to eat in the food court near Emerson. In particular, I’m hugely supportive of CPK’s tortilla soup. It’s spicy and creamy and punchy all at once. Plus, they don’t hold back on the tortilla strips, which are – as are most fried things – outrageously fantastic. The other day, after my last first day of classes (Woah! I’m almost a real person!! ), I headed to CPK for some warm tortilla soup. As I’ve recently been on a soup kick, it got me thinking that I should try to make my own. I mean, you can’t beat four bucks for a bowl of soup, but, clearly, CPK and I are now frenemies and I’m just as competitive as they are Twitter-smart. I did my research and read countless recipes for chicken tortilla soup. After taking bits and pieces from several of them, I scrapped all the bookmarked recipes and came up with my own. The result was truly something else. As a tomato based soup, this dish is naturally hearty. The corn gives it a sweet crunch and the black beans and shredded chicken give it body and flavor. Sautéing the onion, garlic, pepper, and spices makes the whole thing fragrant and authentic. Seriously, this soup is good eats. Side note: I’m extremely afraid of hot oil. This was the first time I’ve used grape seed oil and I now swear by it. No popping, bubbling, or burning, because grape seed oil has a super high smoke point. The tortilla strips were crunchy and not too greasy. This recipe calls for plenty of strips, mostly because you’ll be munching on them as you prepare the soup. The other toppings – avocado, sour cream, and cheddar cheese– add some nice creaminess to balance out the bold flavors in the soup. I’d also recommend testing out cilantro, lime wedges, and queso fresco. 1. Heat oil in a small frying pan. Add tortilla strips and turn to coat. Flip occasionally until browned and firm. Place on a paper towel lined plate to drain excess oil. Continue until all strips are fried. 2. Heat cooking spray or olive oil in a skillet. Add chicken and turn occasionally until cooked through. Let cool and, using two forks, shred into long strings. 3. Heat 2 tablespoons olive oil in a large, heavy bottomed pot. Sauté onions over medium heat until just opaque. Add chopped pepper and spices and sauté until fragrant. 4. Add crushed tomatoes, chicken broth, corn, beans, and shredded chicken. Allow soup to simmer, stirring occasionally, for about 15 minutes. 5. Serve topped with tortilla strips, avocado, cheddar, and sour cream.